The rooms of Mercure Istanbul Taksim Hotel reflect the spirit of Istanbul with their modern artworks and stylish decoration. You can stay at deluxe room with 2 single beds that is overlooking the bosphorus view. 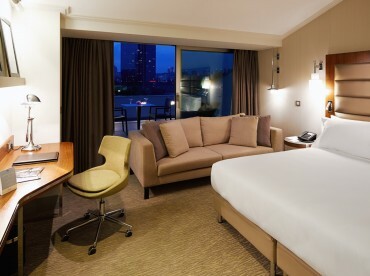 The room includes ensuite bathroom with shower, 40″ LCD TV, mini bar, wireless Internet, espresso machines, safebox, hairdryer, bathrobe and complimentary drinks on minibar to make your stay comfortable and make you feel the city atmosphere. Mercure Istanbul Taksim Hotel offers its guests professional service and peaceful stay in a peaceful ambiance.